Dutch navigation service provider TomTom, which entered the Indian market in September 2011, has strengthened its foothold in the country by updating its maps further and expanding to around 7,200-plus cities and towns for its VIA Series of portable navigation devices. It has also upgraded its MyTomTom mobile app for faster map downloads. The upgraded app has a different interface now and incorporates features like advanced lane guidance with split screen, better zoom in/out, modified address search functionality, improved display with font size & line result display changes and auto switch-on during car ignition. It has also upgraded Points of Interest (POI) (specific locations) and it enables users to move to the next POI within the same search. Last year, it updated the maps for 5,500-plus cities & towns in India, which means it is now covering around 12,700 locations. TomTom's VIA series of personal navigation devices were launched in India in 2011 and these are currently available online, at retail chains and independent car accessories stores. The pricing starts from Rs 15,000 and the key feature includes landmark navigation to help users find their destinations. 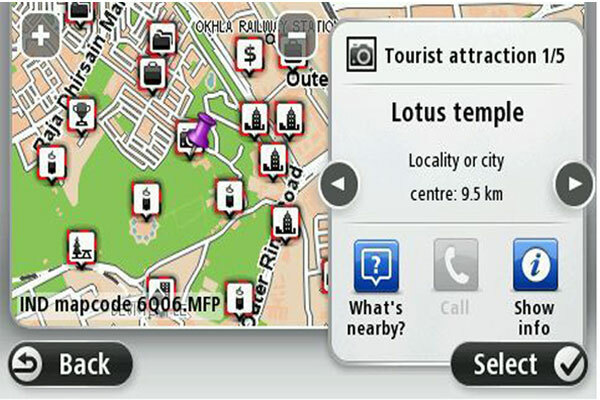 TomTom maps feature all monuments, chowks, parks and other attractions â€“ so that a user can search for the nearest landmark via TomTom devices and easily find the route. Hands-free calling and advanced lane guidance are also enabled. Soon after entering the Indian market, the Dutch player bought out 100 per cent stake in its India joint venture. The JV was first formed in 2008 with the Indian industrial group Kalyani and was initially called Tele Atlas Kalyani India Pvt Ltd, which was later renamed to TomTom India Ltd.